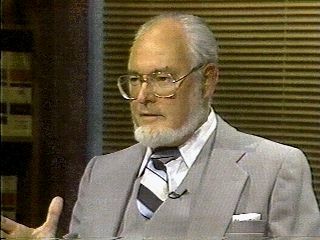 In 1978, Senator Paul Carpenter, Chairman of the Senate Education Committee, produced an abundance of documents relating to "questionable" expenditures by the Department of Education, under Wilson Riles, in their effort to drown out the voice of voucher proponents. State law precluded the committee from taking testimony without granting immunity. The incriminating evidence was turned over to the Attorney General, and the story ended. In 1984, I made a request to the Foreman of the San Mateo County Grand Jury to investigate "questionable" activities of the Sequoia Union High School District. These activities involved "extra credit" assignments for students to "lobby" Representatives for the Districts legislative proposals. The response from Dan Foster, Chairman of the Grand Jury Education Committee was that "...we do not believe it an appropriate endeavour of the Grand Jury to pursue your request further." Using children as couriers in our schools to promote the legislative goals of the "education monopoly" is a serious breach of the trust placed, by the People, in elected school administrators. In 1991, activity by public servants in San Mateo County resulted in the placement of a sales tax measure (MEASURE A) on the November ballot. Measure A, also known as the Best Schools Proposal, was a creation of an elitist committee of business, education, labor and political leaders. It would have raised the sales tax to 8.75% at a time when the exodus of businesses in California was high. Questionable expenditures involving political advocacy were made by government agencies in the process of preparing the measure for the ballot. Serious environmental concerns were overlooked in the process. Jack Hickey was instrumental in bringing about the defeat of Measure A. Another measure, prepared by the Redwood City Elementary School District, would have placed a parcel tax on property owners in the district. Questionable expenditures involving political advocacy were made by the District in the preparation of that measure. That measure, conditioned on the absence of a competing measure, was removed from the ballot. Printed material, from an unidentified source, emanating from that office, indicated that the measure would be resubmitted to the voters in 1992. In 1999, The San Mateo County Community College District spent $275,000 for a voter survey and PR campaign. See SMCCCD-PR or Felony?. Their $148,000,000.00 Bond proposal, Measure A, was defeated by a slim margin. Jack Hickey was instrumental in bringing about that defeat. 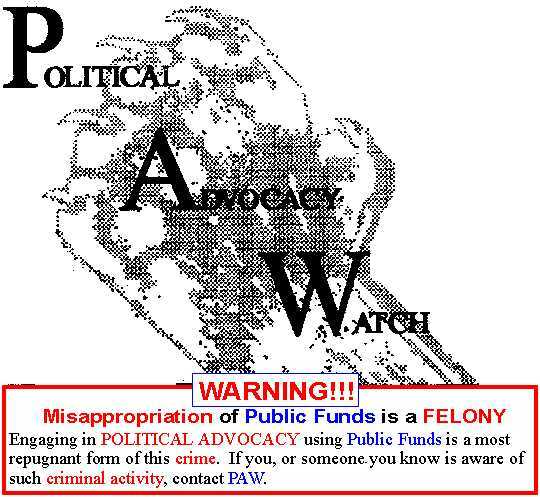 PAW has been formed to serve as a watchdog committee to uncover such questionable expenditures and other breaches of trust, and refer them to the appropriate agency for investigation and/or prosecution. Information gathered from thousands of independent sources monitoring local agencies(including schools, school site councils, etc.) can be analyzed to uncover possible criminal conspiracies subject to the RICO act. In a government "Of the People, by the People and for the People", it is the People who provide the framework within which that government shall function. The Founding Fathers framed the Constitution, which is the Foundation of our Nation. We the People, exercising our rights under that Constitution, have expanded that initial framework through our elected representatives. Administrative agencies of government have been created to carry out the "Will of the People". Whether elected or appointed, officials of these agencies have been placed in positions of trust by the People. They are entrusted to expend resources placed at their disposal by the People, for purposes defined by the People. It is natural for those in positions of power to seek expansion of their "empire". The mechanism framed by "We the People" for creating, modifying or abolishing these agencies requires legislative concurrence by elected representatives of the People. In many instances, public hearings are held by these legislative bodies to provide a direct forum for the Voice of the People. In addition, public hearings are held by the agencies themselves. We the People have framed it that way. When those in power go beyond the framework provided, the system breaks down. When they promote candidates or issues to the general public, they are engaged in "political advocacy". Political advocacy in such instances, is unlawful. When they misappropriate public resources for "unlawful" activities, they are committing a felony. 3. to propose legislation for strengthening the framework within which these agencies function. If the people are to be heard, subsidized speech by public servants cannot be allowed to drown them out. What then of the speech of such agencies? May they speak "freely" using the People's resources for any purpose they choose? Clearly, they must not. BUT, they do! More than half the State's budget goes for education! $10,000/yr per student is outrageous! have a VOICE that is deafening! Whose money pays for their VOICE? Denying teachers the right to make political choices! Teachers money was used AGAINST them! PAW is planning a nationwide network. One PAWNET per state. e.g. PAWNETCA for California. County coordinators are needed. Volunteers, with independent websites, are being recruited to monitor local government agencies. Referred to as a PAWN, their websites will bear the 9-digit ZIPcode of the agency being monitored. e.g. PAW94062xxxx could be a PAW website for the John Gill Elementary School in Redwood City. This school is in the Redwood City School District(RCSD), and, as its parent(RCSD), has engaged in questionable activities in the past.